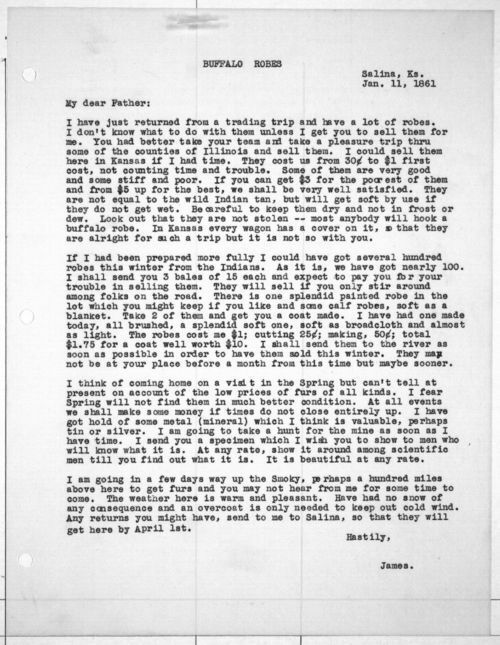 In this letter, James R. Mead writes to his father concerning his buffalo hunting and trading. He has just returned from a trading trip. He does not know what to do with all of the robes, so he plans to send them to his father. He includes some advice about the best way to care for and sell these robes. He is hoping to come home to Davenport, Iowa, for a visit in the spring, but only if the fur prices were on the rise. In a few days he is heading north to get more furs. These typed copies of the James R. Mead's letters were donated to the Kansas State Historical Society by Mr. Mead's family in 1940 when the originals were still owned by the family. The originals are now held by Wichita State University.